Here, the steep mountains to be encountered in most of the Cyclades give way to low, rocky hills, which combine with superb beaches to make up the landscape of the island. The capital, Hora, with its colorful harbor in which little fishing-boats nestle happily side by side with luxury yachts, presents quite a different picture from the majority of Aegean island towns. While it is usual for island villages to be built on naturally amphitheatrical sites, Mykonos is spread out over a flat area and conveys an impression of solid aesthetic cohesion. Along the whitewashed streets stand brilliant white box-shaped houses with stepped walls for sitting on, wooden doors and windows and brightly coloured balconies. These are interspersed with small but impressive churches, pretty little taverns and shops selling souvenirs and other goods, and the overall sense is of being inside a film set. On the low Kastro hill is the complex of churches known collectively as Our Lady 'Paraportiani', a superb arrangement of whitewashed masses created over the centuries and now recognized as a national cultural monument. Of particular historical and aesthetic interest are the medieval houses in this district of the town, which stand like a wall above the sea protecting the west side of Hora. The Archaeological Museum of Hora contains finds from tombs on the nearby island of Rhenia, sculptures, vases and figurines. The Folklore Museum brings together a number of collections of furniture, icons, pieces of sculpture and folk musical instruments. Mykonos is also the home of the Nautical Museum of the Aegean, which has interest all of its own. The countryside of Mykonos is a mixture of grey-green rocks ringed by prickly pear plants and little fertile areas carpeted with wild flowers. Here and there are tiny-whitewashed chapels and windmills. Ano Mera is, after Hora, the most important of the older villages on the island. Standing 8 km. to the east of the town, Ano Mera has the interesting monastery of Our Lady Tourliani, ornamented with fine woodcarvings. The church has a collection of valuable ecclesiastical vessels, vestments and embroideries. The courtyard contains an interesting bell-tower and a marble fountain. Here lovers of the sea will find outstanding golden beaches such as Agios Stefanos, Psarou, Kalafatis, Plati Gialos, Ornos, Elia and Panormos. 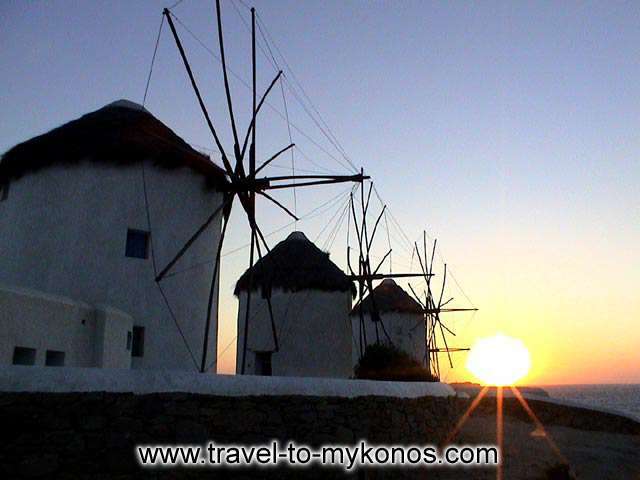 Mykonos is a busy island with all the amenities of a modern resort and with plenty to-do - by day or night for those who want to have a lively time. Yet visitors fond of more peaceful holidays will still find quiet corners in which to relax.